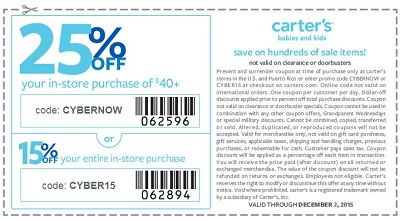 Cyber Sale 2015 is still on at carter's store in the U.S. and online on the official website. Everything is on sale with 50% discounts. Plus, print the coupon and save an extra up to 25% off your purchase. Spend $40 or more and receive 25% discount (online use promo code CYBERNOW at checkout). Or, receive 15% discount (online use promo code CYBER15) on your entire purchase. The coupon is available through carter's emailing. Offer expires 12/02/2015. More details about the offer at store or online.